Regular rain events in the lower Midwest favor the establishment and spread of a variety of turf diseases, including gray leaf spot (GLS). I have more gray leaf spot here in Indiana (from the Ohio River valley to the Michigan border) in the past three weeks than in the past 5 years…combined. Gray leaf spot is a foliar disease that affects perennial ryegrass (PRG) and tall fescue. It is caused by a fungal pathogen (Pyricularia grisea) that readily infects and kills leaf blades. Leaf infections can progress into the crown areas, resulting in death of individual plants. Unlike dollar spot and brown patch fungi, the GLS pathogen produces wind-dispersed spores–perhaps thousands–every day—from a single lesion! That’s why GLS seems to kill so much grass so quickly. Severe outbreaks will result in the death and decay of extensive areas and ruin the entire turf stand (Figure 1). Figure 1. Gray leaf spot can quickly kill large areas of perennial ryegrass (and tall fescue). In general gray leaf spot poses less of a threat now than 10-15 years ago, largely because of the reduction in PRG acreage across the Midwest and the introduction of cultivars with some inherent resistance to infection. However, juvenile perennial ryegrass is unusually susceptible, regardless of cultivar. Therefore, in seasons like this one, the disease creates havoc wherever PRG has been used to repair turf damaged from the relentless environmental stress during July and August. At this time of year, other leaf spot diseases can be confused for gray leaf spot. 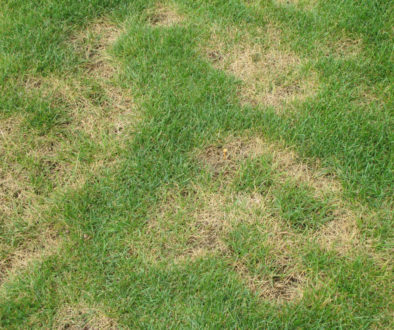 If you manage PRG or tall fescue, obtaining an accurate diagnosis is essential. Otherwise, you may bear an unnecessary expense with costly “curative” fungicide applications. Side note, the “curative” application will “cure” nothing. Observing a few leaf spots (Figure 2) or the “fish hook” symptom is not enough to conclude that the gray leaf spot pathogen is the causal agent. The only sure sign is the presence of very characteristic conidia (spores) that can be observed only microscopically (Figure 3). Figure 2. Leaf spots and gray mold are part of the GLS syndrome. Figure 3. After overnight incubation, GLS is easily identified by presence of characteristic spores. Chemical control options are available. The most effective fungicides are QoI (strobilurin) products such as Heritage, Insignia and Fame (formerly Disarm). Thiophanate-methyl (Cleary 3336, etc.) also is very effective. Chlorothalonil and DMI fungicides have limited efficacy and may be useful when disease pressure is low. If the disease is established on site, repairing damaged areas (especially tee boxes) with perennial ryegrass at this time of year will be a challenge. Juvenile PRG (regardless of cultivar) is quite susceptible to infection. Periods of warm rainy weather during the “grow in” will promote more infection and death of young seedlings. If PRG is the only option, fungicide should be applied prior to over-seeding to reduce local inoculum, and then repeated after seedlings emerge. Caution: GLS populations can rapidly evolve towards fungicide resistance, so avoid consecutive applications with the same class of fungicide and always tank mix with chlorothalonil.